The 2030 Agenda for Sustainable Development is a follow-up to the outcome of the Millennium Development Goals (MDGs) and was agreed upon by consensus at the informal meeting of the UN plenary on 2 August 2015. The outcome document of the aforementioned informal meeting is entitled, “Transforming our world: the 2030 Agenda for Sustainable Development” and sets aside 17 Sustainable Development Goals which will stimulate action over the next fifteen years in areas of critical importance for humanity and the planet. Prior to this – on 29th December 2014 – the United Nations – through its resolution 69/244 – decided that the United Nations Summit for the Adoption of the post-2015 development agenda will be held from 25 to 27 September 2015 in New York, and convened as a high-level plenary meeting of the General Assembly of the United Nations. This Summit is now ongoing and world leaders, including the Prime Minster of India Shri Narendra Modi are participating in this critically important global summit. The Sustainable Development Goals (2015-2030) will replace the Millennium Development Goals (2010-2015) and will also try to achieve the targets set by the MDGs that may not have been achieved thus far. The SDGs are aimed at resolving the key social and environmental challenges being faced by the Planet today and will prepare the world to take bold steps and initiatives in ensuring a clean, green and healthy environment for the present and all future generations. The 17 Sustainable Development Goals are listed below. 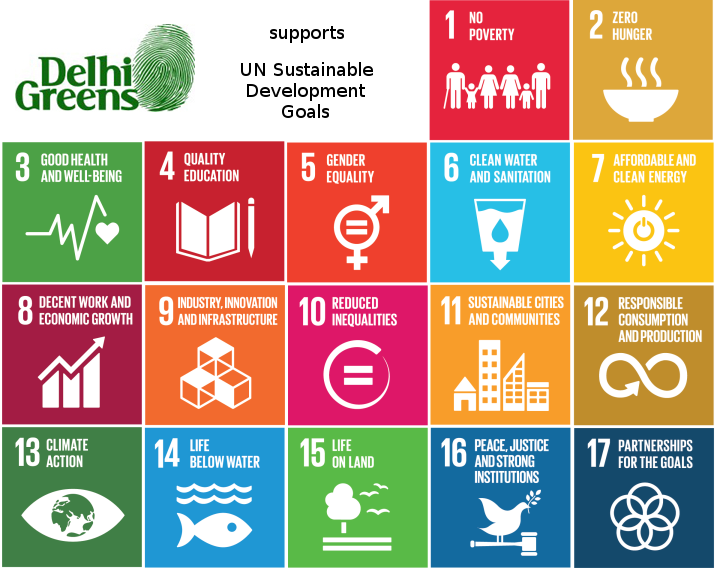 The Delhi Greens organisation supports these 17 SDGs and will work with all stakeholders to ensure that each of these goals are realized, in the best interest of Delhi, India and the world. Thank you for this valuable information! Helped me a lot. Why did we shift from MDGs? The first 15 years of MDGs have been completed. The next 15 years are focused on the SDGs.